Do You Go For The Classics, Or The Cutting Edge? 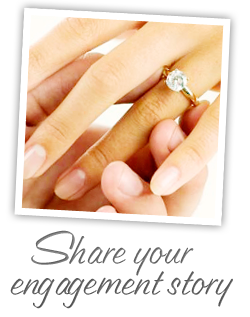 Many people aren't too aware of engagement ring trends until they start to consider shopping for one themselves. They might know a few details here and there, but without realizing everything that goes into crafting one. Or how much the ring has changed over the years. Consider the classic scenario: a couple out on a date. They've been together for a while now, and she's beginning to wonder if he'll ever get around to popping the question… but tonight, they've gone somewhere special. There's a different energy about things this evening. She has a feeling it might finally happen, and begins to wonder: is this The Moment? It's a dreamlike, fairy-tale scenario. He gets down on one knee, opens the box to reveal a beautiful engagement ring, and asks her to spend her life with him. “Yes!”, she exclaims. And the ring goes on her finger. But hold on a second… let's take a closer look at that ring. What does it look like? What decade is this scenario taking place? If this proposal was happening the 1920s, the young fella might be giving his girl a brightly colored stone. Possibly with a bold geometric design in the Art Deco style. The 1940s? She'd probably be getting a diamond that was in gold. Platinum is the norm for settings, but the war had made platinum mighty scarce, after all. Maybe our scenario is taking place in the 1980s. Big hair, Madonna playing the background, and our right has a large sapphire stone inspired by Princess Diana's 1981 wedding. 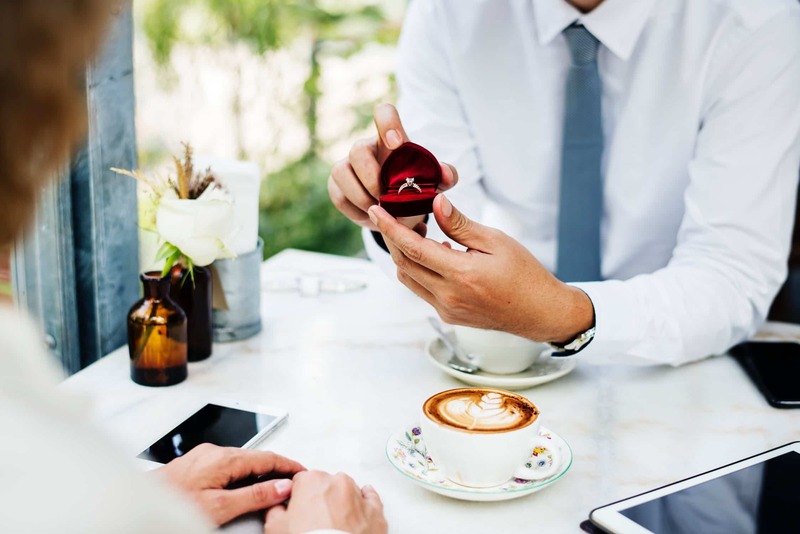 True love might last forever, but when it comes to engagement ring trends, change is the only thing you can really take for granted. 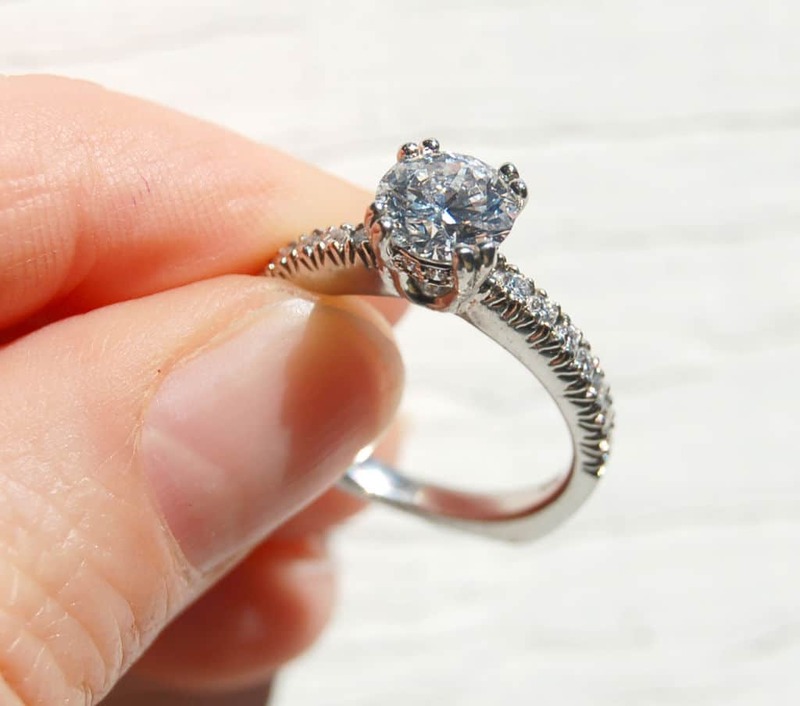 When selecting an engagement ring, some people might go for custom designs. Others for whatever is cutting-edge that year. Diamonds weren't always a girl's best friend. 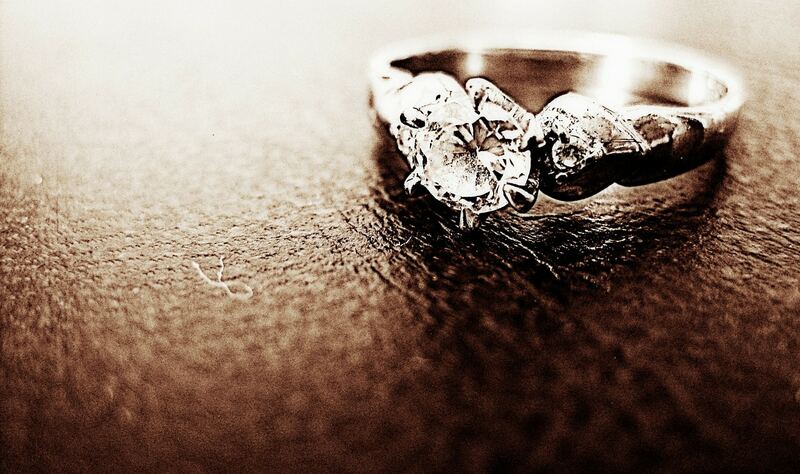 Engagement ring trends in medieval Europe didn't follow the tradition of using a diamond. Not until 1477, anyway. That's the year that Archduke Maximillian of Austria gave his betrothed, Mary of Burgundy, a special gift. In either case, it was a pretty good move on Maximillian's part. As a result of their marriage, his power grew stronger. And a few years later, he would ultimately become Holy Roman Emperor, which at the time was a pretty big job. As is often the way, courtiers and nobles began to copy the guy in charge. 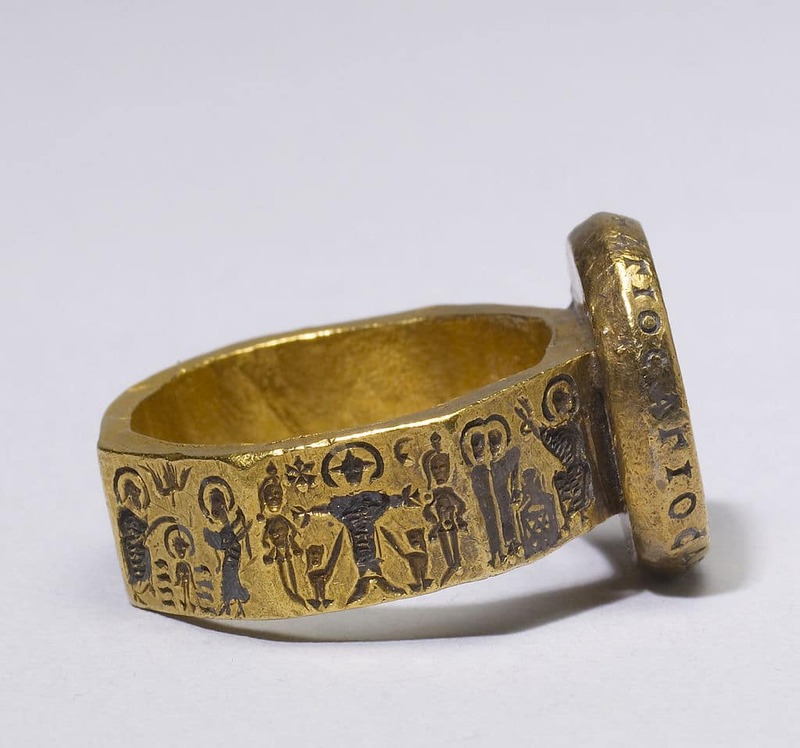 Plenty of noble ladies found themselves getting a diamond ring before marriage (although presumably, these rings didn't all have the letter “M” on them). 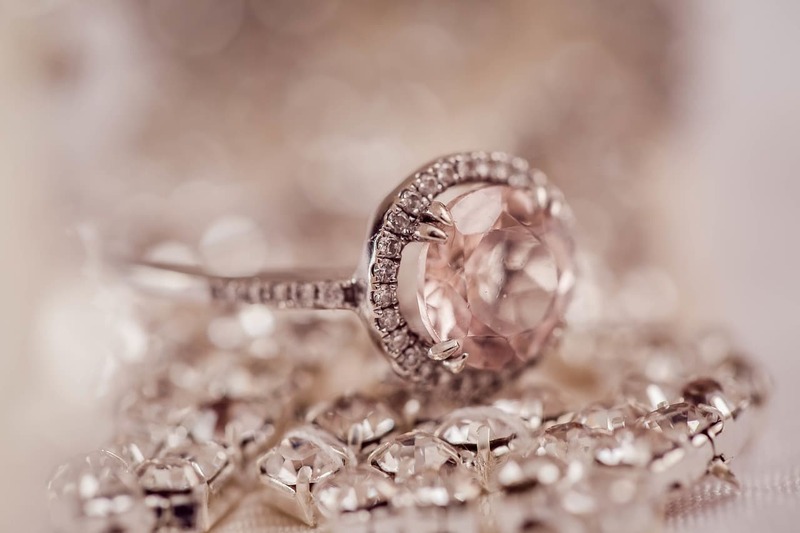 In a way, you could say that the very first of the engagement ring trends was the engagement ring itself. 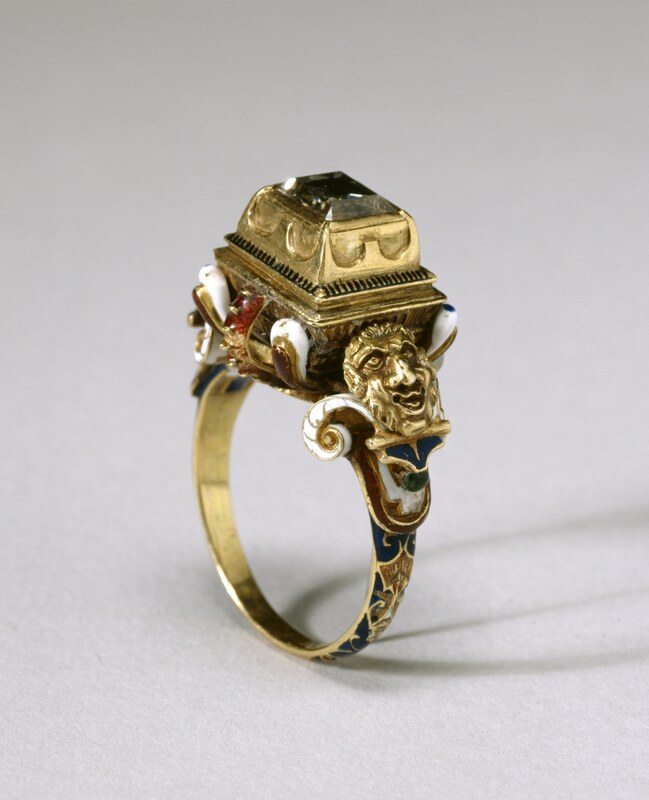 Years passed, and elaborate engagement rings were sometimes seen adorning truly wealthy couples. But they were generally not available for much of the population. It wasn't until the late 1800s that the tradition began to become popularized. As the middle class emerged in industrialized nations, soon everybody wanted to celebrate their engagement in royal fashion. In the 1880s, Charles Tiffany of Tiffany & Company introduced a six-prong setting that changed how diamond rings were made. The “Tiffany Setting,” as it came to be known, was unique in that it showed off every side of the diamond, and let the light shine through it from all angles. The design became hugely popular. And the engagement ring went mainstream. Before we get started on our tour of 20th Century rings, let's take a look at a few quick terms. 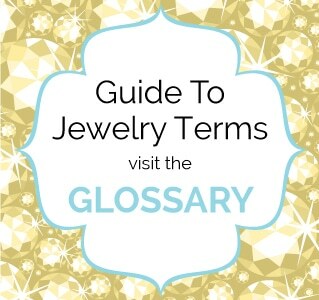 If we're going to be making our way through decades of engagement ring trends, it'll help to know the lingo. Setting - this is the type of base that supports the ring's precious stones. Metal - this is the type of metal used to make the band of the ring. Band - this is the part of the ring that winds around the finger. Stones - this refers to the stone or stones that are set in the ring. Shape - this refers to the cut of the stone. 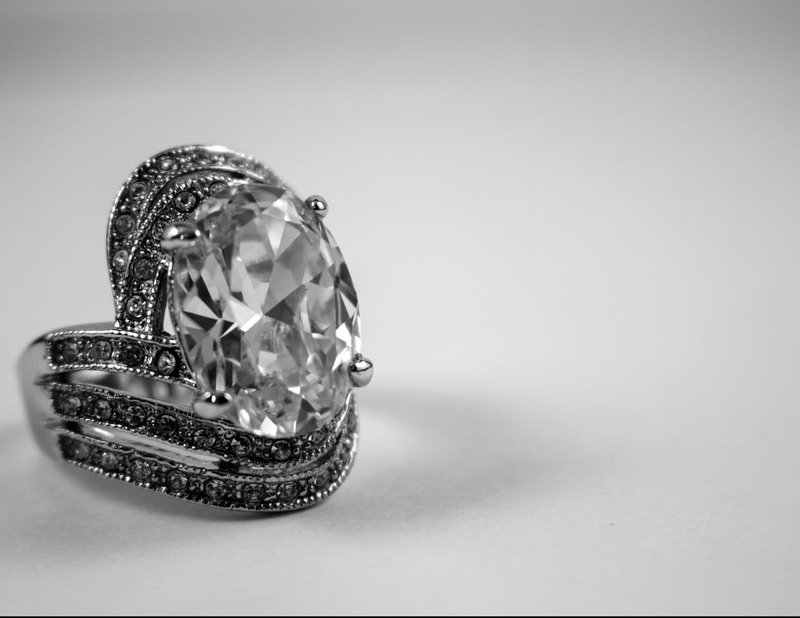 At a very basic level, the setting exists to hold the stone in place, and display it in the most attractive possible way. A setting that doesn't do a good job of showing off the center stone is a lost opportunity, especially if you've chosen a nice stone. Likewise, the setting also has to be strong. A loose or easily damaged setting will result in the stone falling out, and nobody wants that. 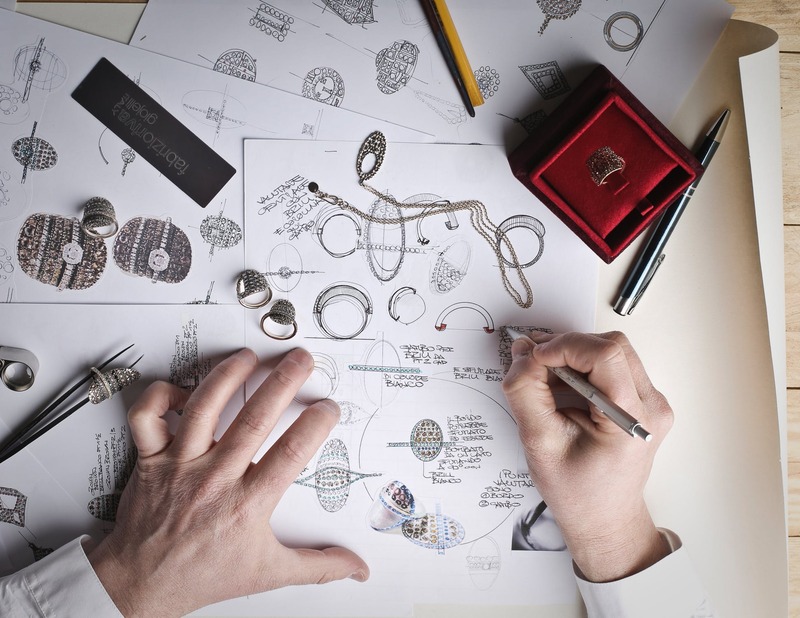 The most popular setting is a six-pronged setting. It's a classic because it's been around for a while. It also does a great job of showing off the center stone by maximizing the surface area that can catch light. 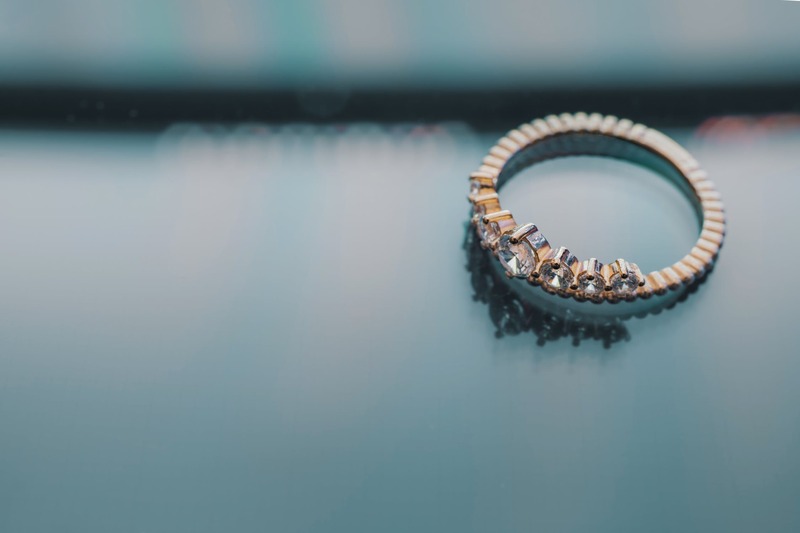 Charles Tiffany introduced a version of the prong setting in 1886, and Tiffany & Co. values its invention so much that they have actually fought in court to make sure people refer to it as the “Tiffany Setting,” and that other jewelers don't copy their style. This setting gets its name from its arch mount, which looks like the arches in a cathedral. 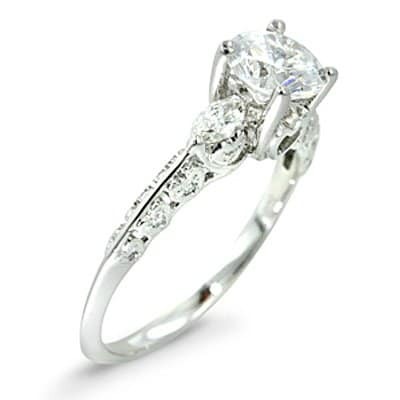 The style is one of the most popular, as it holds the diamond securely and elevates it for light. On the downside, it's a little harder to clean than the average setting. The bezel setting is one of the oldest settings out there. In a bezel setting, the circumference of the stone is wrapped in a metal band, so it fits very snugly in place. It's easy to clean, and the odds of losing the stone are very slim. Just looking at this one makes us nervous. But there's no doubt about it: tension settings do look spectacular. 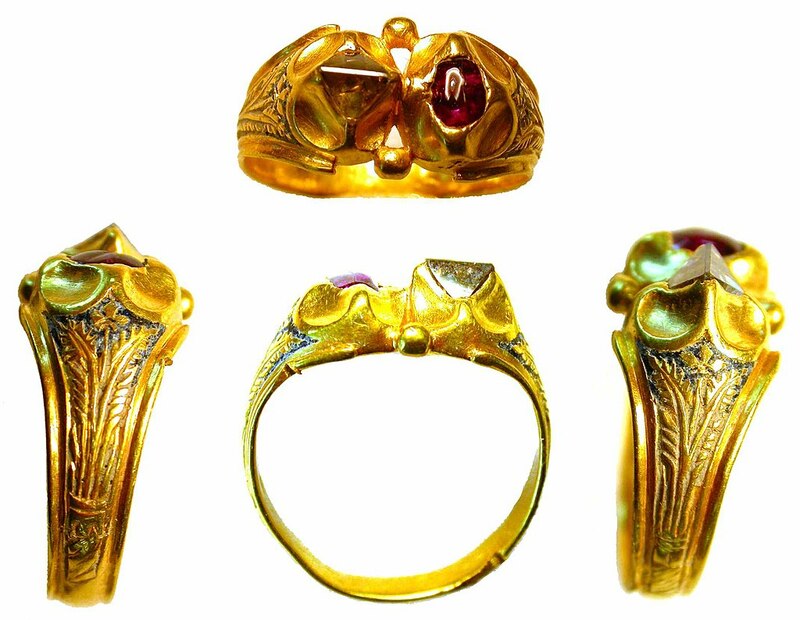 By using the bands of the ring itself as the setting, the gem gets a lot of light passing through it from the side. The effect is quite eye-catching. The downside? If you're worried about the gem being less safe, you're not wrong. Halo setting emerald engagement ring. Image via Pixabay. 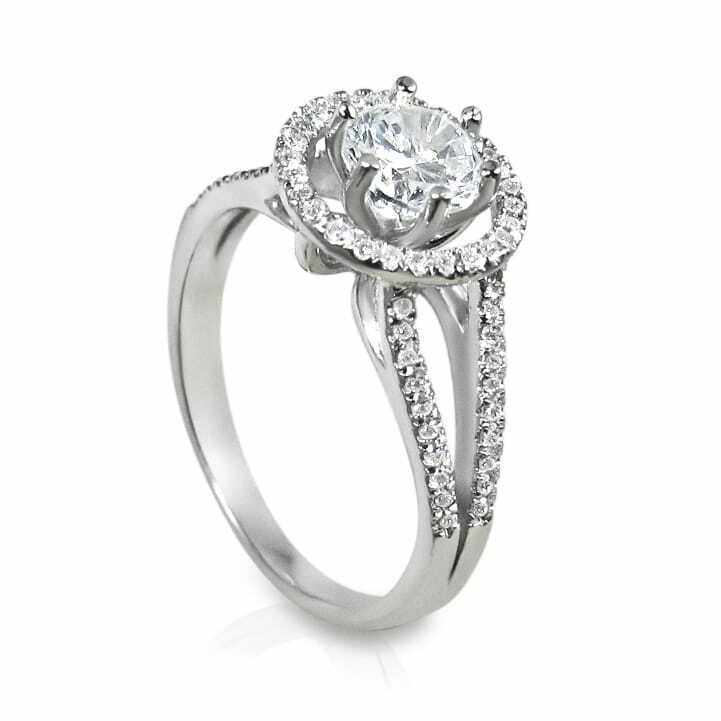 A halo setting is one in which the center stone is surrounded by many smaller ones. It looks dramatic, and it's one style that experiences cycles of high and low popularity. There are many others, but these are some of the styles of setting that show up in trends throughout the decades. Metals are not quite as complex as the settings themselves. 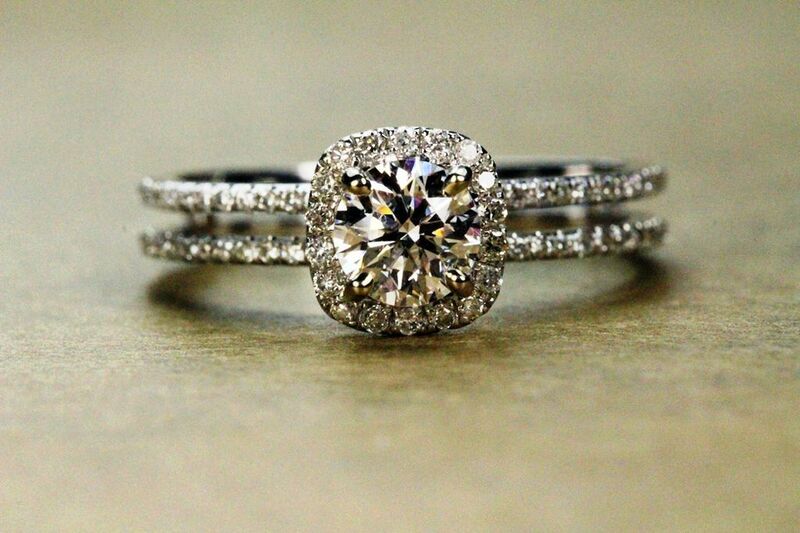 But they important nonetheless, as they will drastically change a ring's appearance, durability, and price. Platinum was the metal of choice in the early part of the 20th Century, and it's still a popular pick. It's durable. If the band or setting are unusually complicated, having a strong metal like platinum will add a degree of sturdiness to the ring. Yellow gold is and will continue to be a timeless choice. The metal is soft, though, so it can be a risky option for certain settings. Soft, as with yellow gold. The most significant difference here is the color of the metal. Silver is an excellent choice in many ways, and shouldn't be overlooked. It's classic and sturdy, and also considerably more affordable than platinum. Titanium is famous for being indestructible. Okay, that's not technically true, but the metal has gained popularity recently, as its strength can be trusted to hold more elaborate settings. Band diamond engagement ring. Image via Pixabay. Band styles change as much (if not more) than anything else. Throughout the years, there have been wide bands, ornate, plain, skinny, twisted… each one having a dramatic effect on the look of a ring. Very durable, and have been a popular choice for many years for just that reason. Certain settings work better with a wide band, but the downside is that on certain fingers they may be less comfortable. 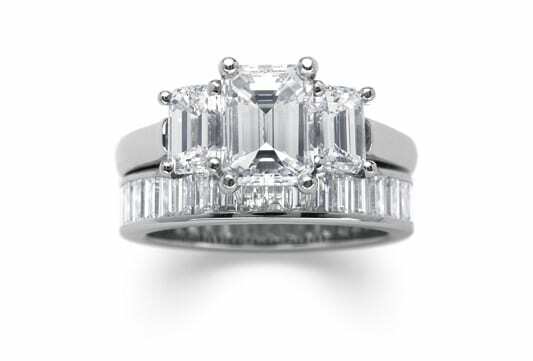 Thin bands are more popular than ever lately, as they can make a moderate size center stone look absolutely giant. 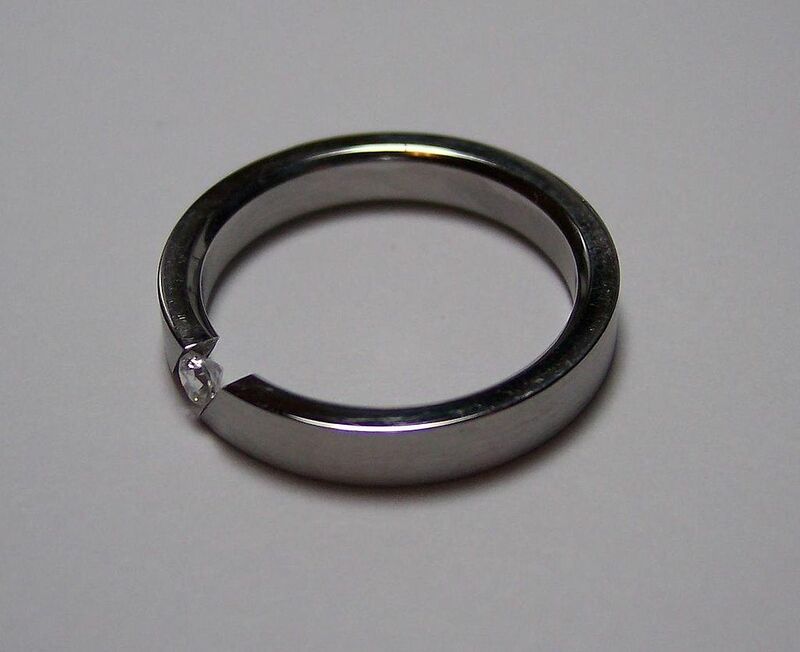 Split shank engagement ring. Image via Pexels. A split shank diverges as it approaches the center-stone, forming a fork on either side of the stone. It's a lovely choice and very refined. 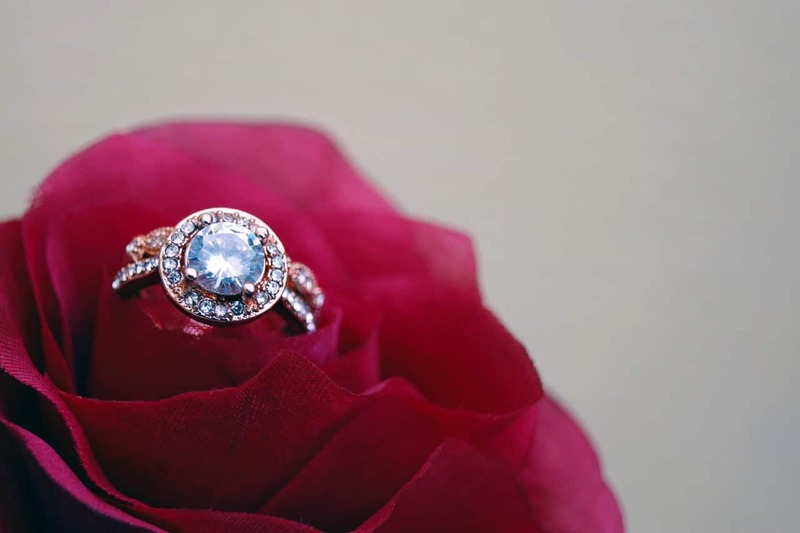 The diamond (or gemstone) is the highlight of any ring. 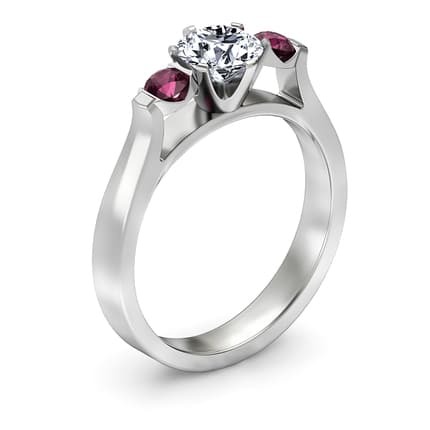 Whether it's accompanied by accent stones, or a proud solitaire, the jewel is what people usually notice first. 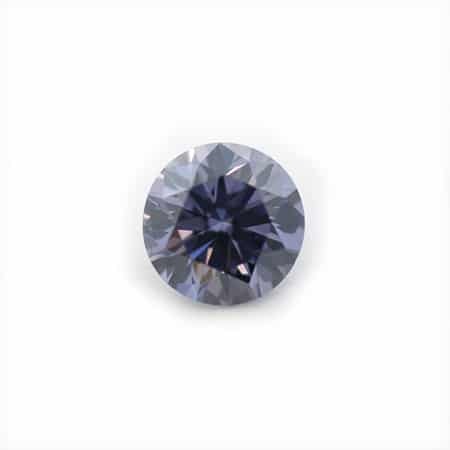 The diamond is so common that it is almost expected. They are the most expensive stone to use, but they are famously hard and therefore difficult to scratch. 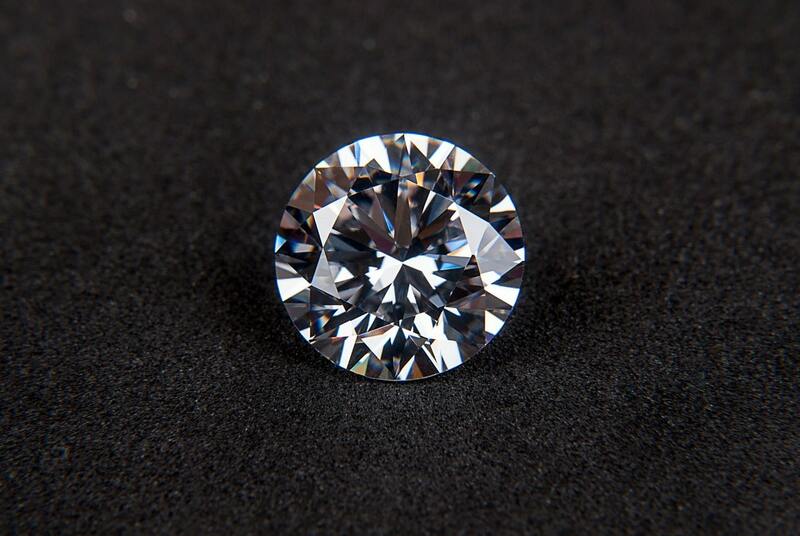 The clarity and cut of the diamond will affect how the light shines through it. 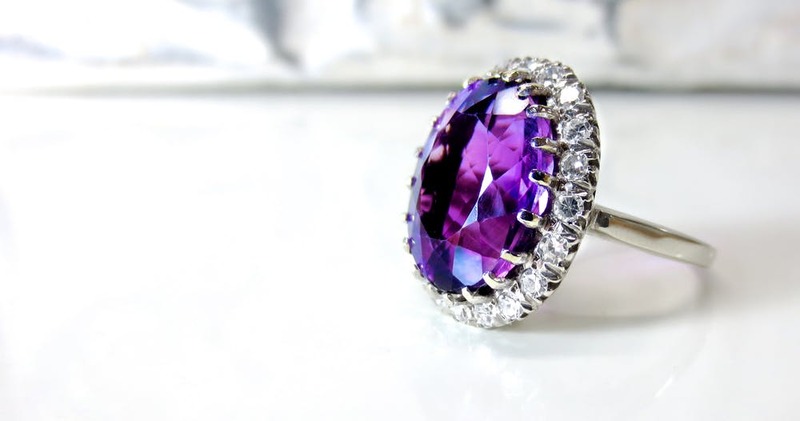 Colorful gemstones have become a popular alternative to diamonds for many reasons, in part because they can look spectacular simply by having a pop of color where most people expect white light. 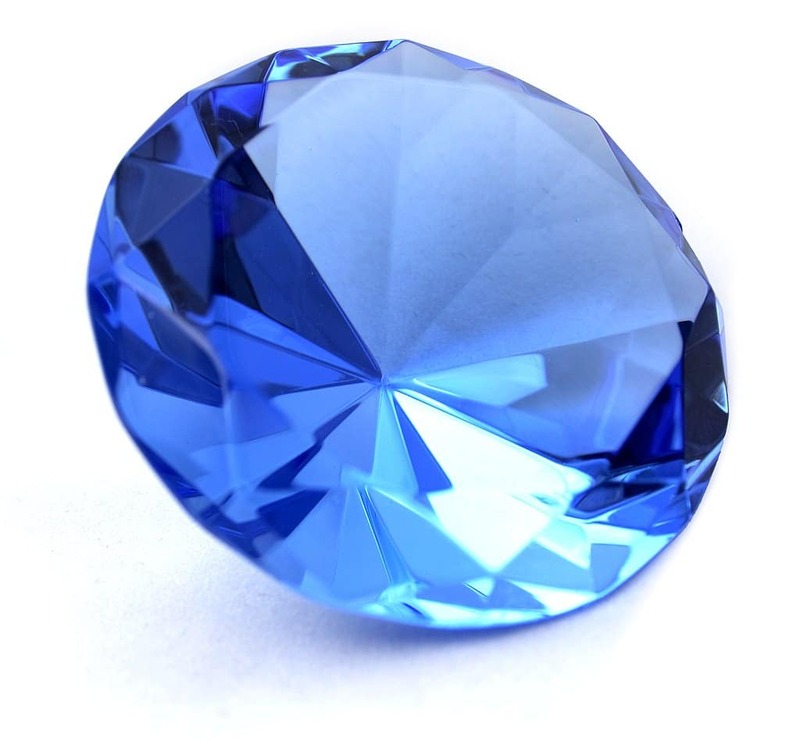 Rubies, sapphires, and emeralds all make attractive center stones. Green, blue, pink, and yellow diamonds are all intriguing ways to take a classic and personalize it. Whether to match someone's eyes, or because the color holds some significance, the colored diamond provides a playful take on a constant favorite. The final consideration is the shape (or cut) of your stone. Certain cuts and certain settings pair well together, and others don't, so if you're in the market, you'll want to keep that in mind while you're designing your perfect ring. One of the oldest and most enduring cuts out there. 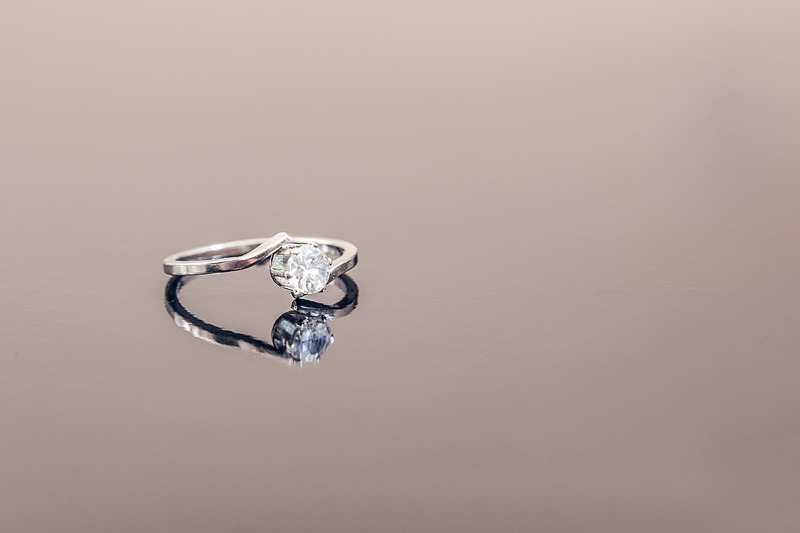 The round cut is perhaps what most people think of when they think “engagement ring diamond.” It's very difficult to go wrong with this choice. The radiant cut does what it says it will. 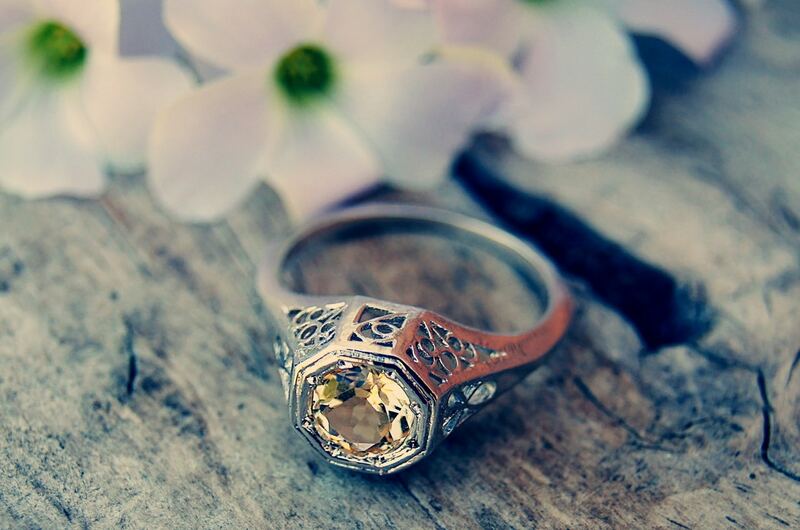 It accents the light, and is especially dazzling with a diamond. 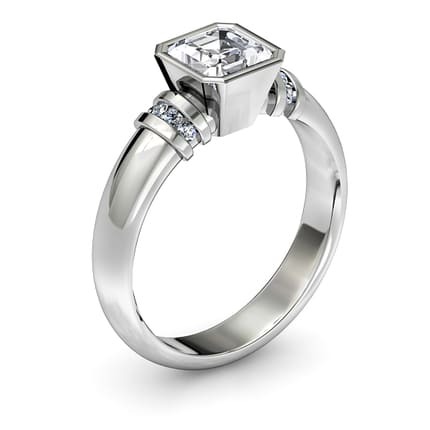 Like the princess cut, this is an angular cut that's great for a diamond or a gemstone. This square cut started to gain popularity in the 1970s and has been a standard ever since. 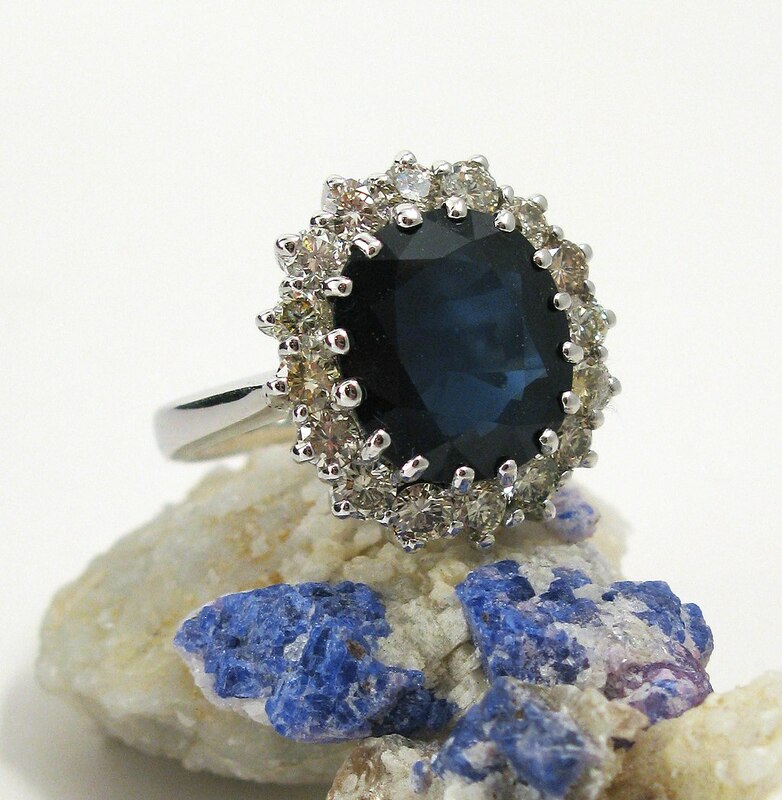 It's eye-catching, and although it works well with diamonds, it's a great choice for a colorful gemstone as well. 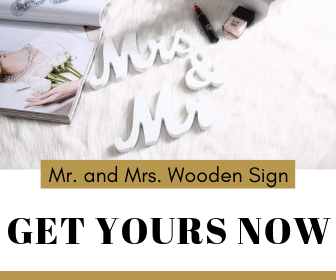 Now that you've shined up your engagement ring knowledge to dazzlingly brilliant levels, it's time to take a trip for the ages. At the outset of the 20th Century, the world was changing drastically. The industrial revolution had spread throughout much of Europe and North America. With the gradual rise of a strong middle class, millions of people started to be able to afford luxury items that had been formerly only reserved for the rich. When it comes to the rings themselves, there are two defining characteristics that make the Edwardian era stand out. First, the gems. Diamonds were a popular choice, but by no means the only one. 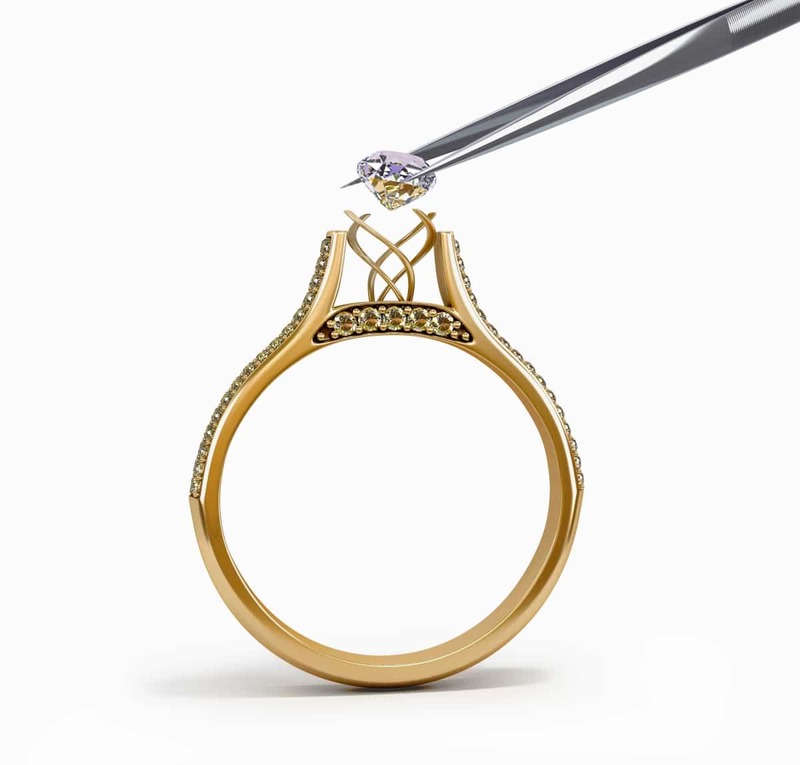 Really complicated cutting methods were still being developed, but most people preferred a diamond that had a relatively simple round cut. 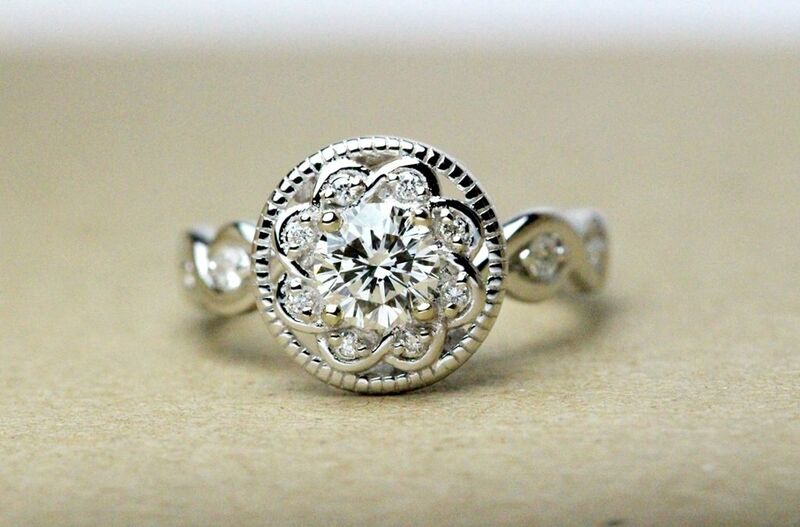 Much of the ornate artistry in the rings can be found in designs etched into the platinum bands themselves. Working with platinum was still fairly new to many designers, but they crafted intricate patterns in the metal. The decade was marked by tragedy. The First World War, known at the time as the Great War, claimed the lives of 10 million soldiers and many civilians on every continent. Many husbands spent years away from their wives, and many mothers raised children hoping the fathers would return home. The themes of love, steadfastness, and loyalty are all strongly reflected in the artistry of these rings. The war would end before the decade, ushering in the age of jazz and flappers. In the 1920s, Art Deco ruled everything from architecture to functional design to poster art. 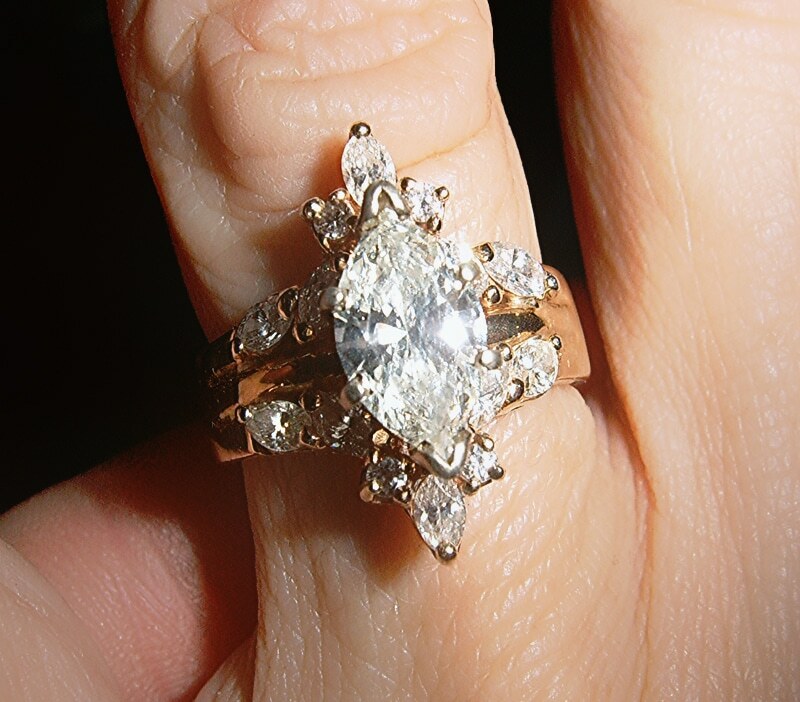 Engagement rings reflected this by breaking with the more traditional style of the Edwardian era. The rings of the Twenties were bold. Geometric patterns were in. Bright color was in. 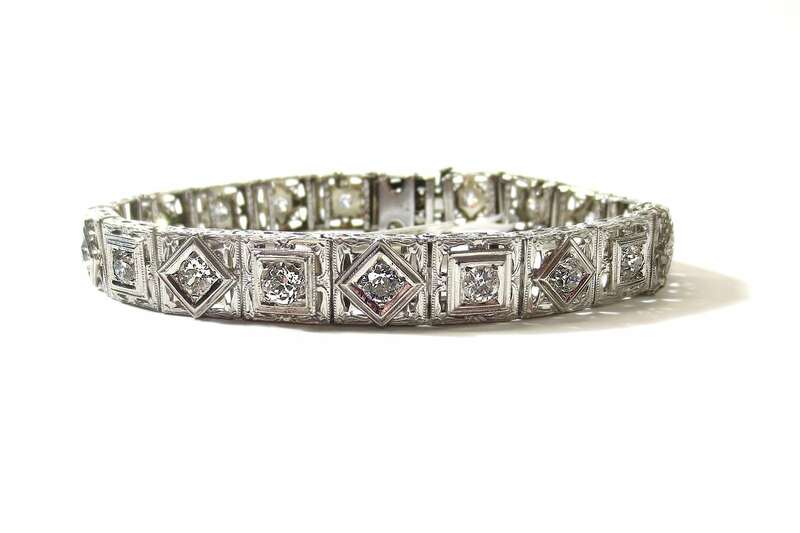 Although diamonds were still the stone of choice, they were often cut in new and interesting ways. The first patterns of smaller diamonds surrounding the large one began to appear. 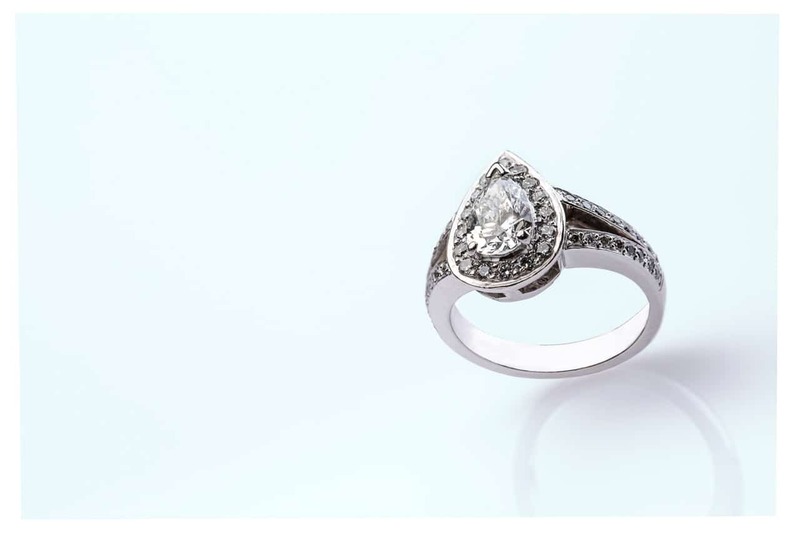 The designers had also made substantial strides in both cutting the diamonds and in advancing the casting processes involved in setting them. This allowed for greater experimentation. In the news, women finally won the right to vote after years of political pressure. The prohibition of alcohol lasted the decade, and became a culturally defining struggle as well until its eventual repeal in the early 1930s. Jazz music, flappers, and gangsters dominated the public imagination. Charles Lindbergh made his flight across the Atlantic in 1927. The new art form known as movies really took off too, as “talkies” replaced silent film. 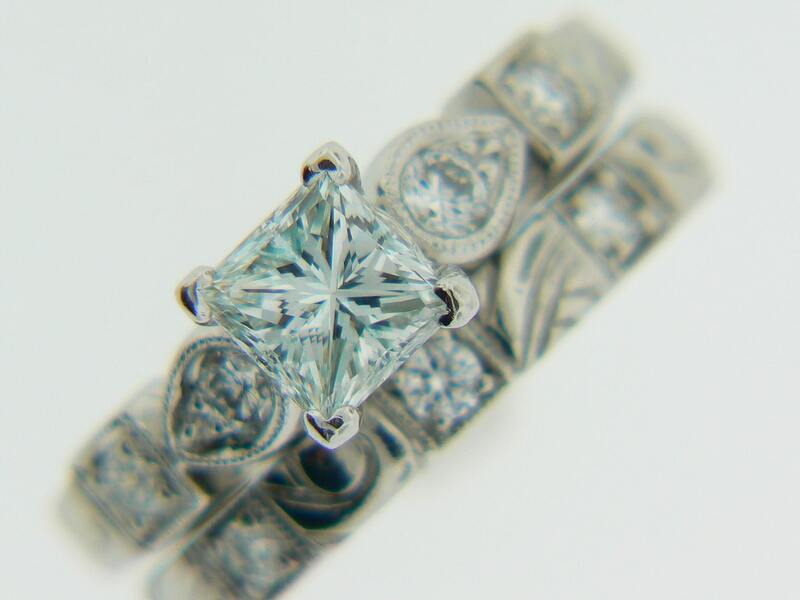 Sharp lines, bold colors, some of the first halo designs and emerald cuts were hallmarks of this “roaring” decade. Although there were certainly low points, the Twenties are often remembered as carefree and imbued with a strong sense of optimism. But the last year of the decade would see an ominous turn of events: the crash of the 1929 stock market, and some of the most difficult years for the average American. It would be a pretty tough decade in which to think about getting hitched. The Great Depression would change the lives of almost every American. Even many of the wealthiest lost vast sums of money. The country's economic woes would define the Thirties. And of course, this would change how people bought jewelry, too. 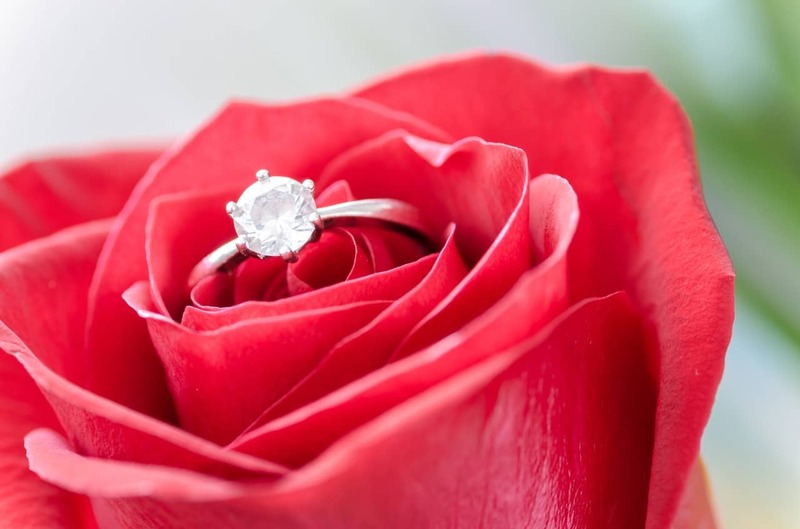 The engagement ring trends of the Thirties are a move toward simplicity. But the Thirties also would eventually bring a sort of jubilant attitude to design, as the latter half of the decade saw a jump in playfulness. At first, people didn't know how long the depression would last. 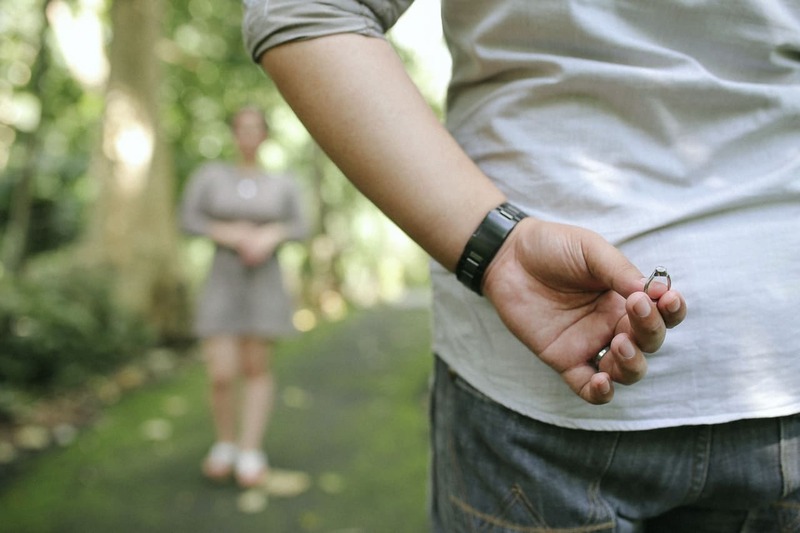 Young couples would reuse jewelry from previous generations. 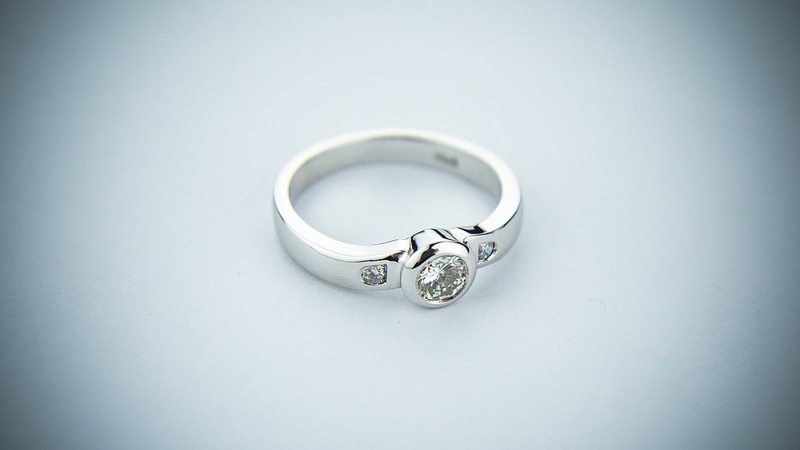 Or buy simple rings that had one stone and a simple platinum design. Although the materials that were available to designers had become more prohibitively expensive, the techniques they had were more advanced than ever. 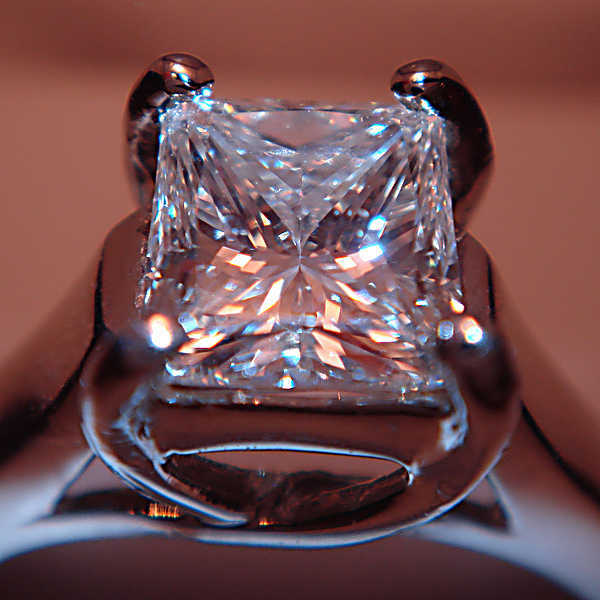 One of the engagement ring trends of the era was to shape the bands in interesting ways. They used fewer gemstones than they had in the Twenties, but they got creative with the metalwork. During the second half of the decade, there was a shift toward more dazzling jewelry, both with engagement rings and with everything else. The artistic period that began in the mid-Thirties is often known as the beginning of the Retro Era, and it signaled that designers were moving on from Art Deco. Art Deco featured straight edges and conveyed strength, while Retro Era designs incorporated ribbons, braided patterns, and a flowery aesthetic. The people demanded art that was light, fun, and a departure from so much of the weariness and hardship they were facing. 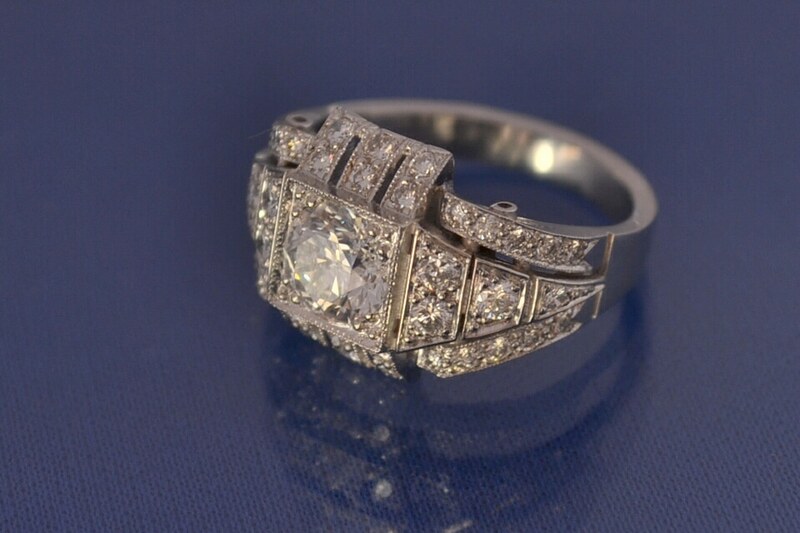 Retro Era rings continue to be a favorite among enthusiasts of vintage style for just this reason. The end of the 1930s brought with it more trouble on the horizon. In 1939, Nazi-controlled Germany invaded Poland, igniting the largest war in history. 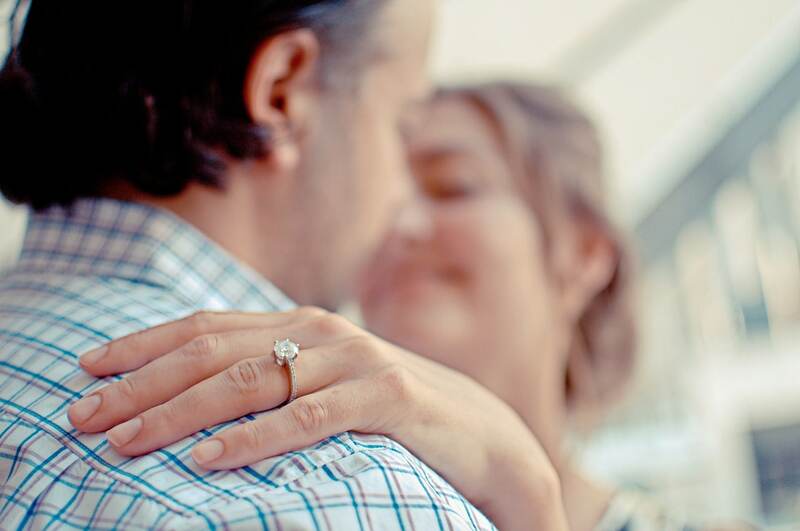 At the outset of the Forties, the engagement ring trends that had begun in the previous decade continued to gain momentum. The flowery designs of the Retro Era had replaced Art Deco as the main contemporary style. The fancy metalwork and curved designs of the bands were still commonplace. But as the United States was drawn into the war, materials would become even scarcer than they had been during the Great Depression. Millions of U.S. soldiers would be fighting overseas. In the first half of the decade, the number of engagements actually taking place went down by a considerable margin. 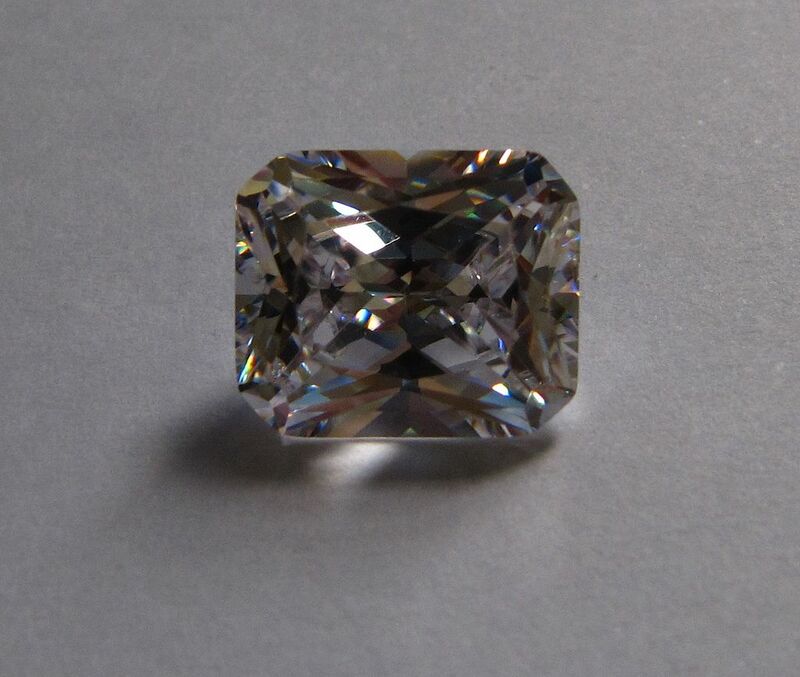 Solitaires became more widely used. Multiple stones were seen less often. 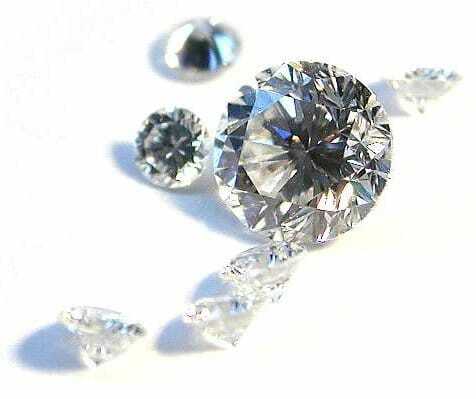 In addition, diamonds were sometimes unaffordable, and other stones began to look at synthetic alternatives. And lastly, while platinum had remained the principal metal used for the wedding bands, this was no longer sustainable. Platinum was badly needed for the war effort, and supplies were almost non-existent when it came to luxury items. 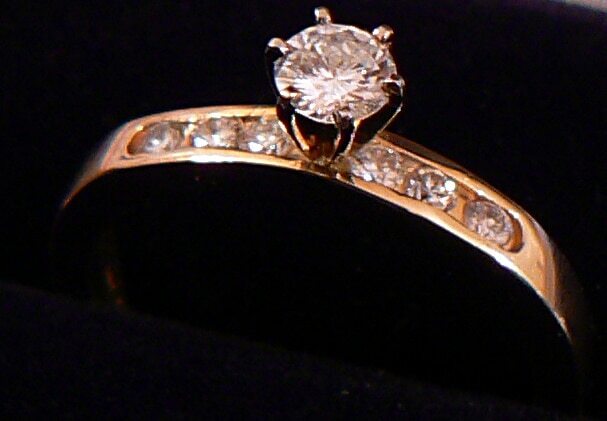 As a result, the Forties were the decade when gold really came into its own as the metal of choice for rings. By the time platinum was reintroduced to the market, it had some competition. After the war, the jewelry maker De Beers launched a wildly successful advertising campaign that ensured that diamonds didn't lose their place in the hearts of the ring-buying public. In 1947, the slogan “A Diamond Is Forever” entered public consciousness. 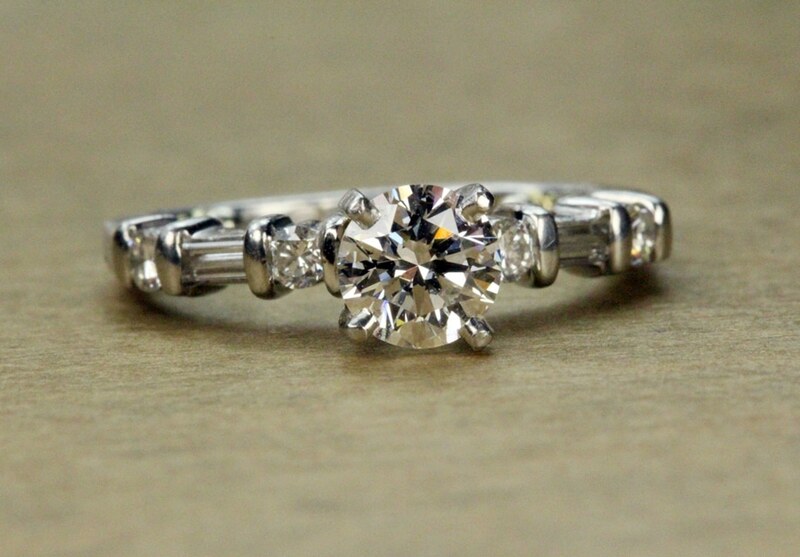 And to this day, it remains far and away the most used center stone for engagement rings. In the 1950s, attention would turn away from war and toward family life, and the glitz of Hollywood. The Fifties saw an increased surge of diamonds entering the market, which lowered their cost to consumers. Gold bands were frequently used, and the decade also saw the end of the Retro Era. Bands would become simpler, and move away from the ribbon-like effect that had started in the Thirties. The Fifties saw a period of relative stability for the first time in two decades. 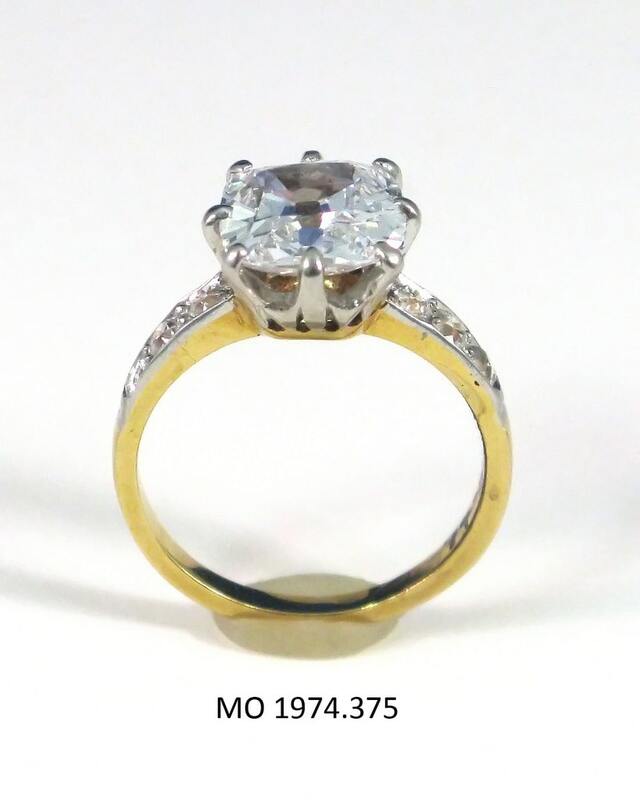 There was a move toward simplicity in the design of the rings, but also a move toward larger center stones. Americans had been tightening their belts for twenty years, and at last, they wanted to aim big. 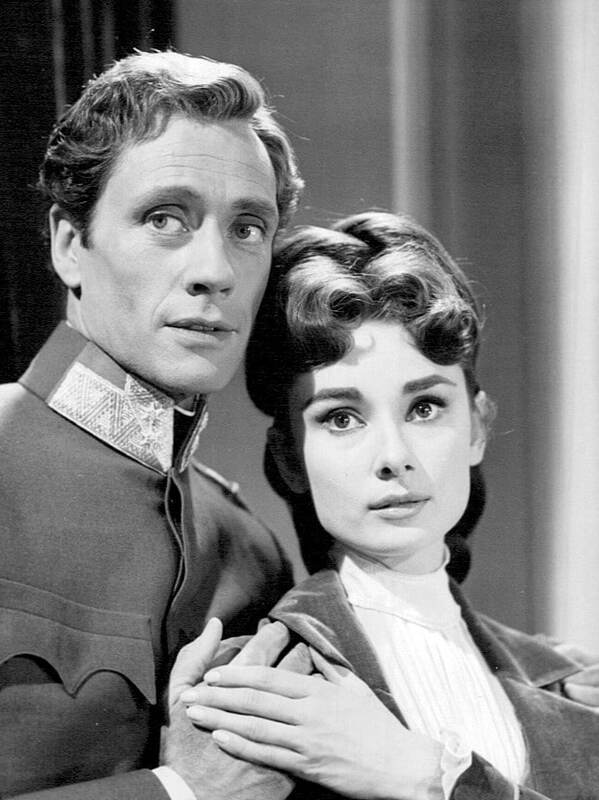 Audrey Hepburn's husband Mel Ferrer began one of the earliest in a series of Hollywood-inspired engagement ring trends. He knew his bride would be in the public eye, and quite aware of her fashion choices. So he presented her with stackable rings in both yellow gold and rose gold, so that she would be able to wear whichever one worked with her outfit that day. The market saw an increase in sales of stackable rings, and the power of celebrity appeal was confirmed. In the Sixties, the need for size and celebrity status would only get more extreme. The Sixties experienced a renaissance of sorts, as Art Deco returned to the mainstream. Elizabeth Taylor, Grace Kelly, and Jackie Kennedy all sported impressive engagement rings that captured public imagination. Jackie Kennedy, in particular, had an impact. 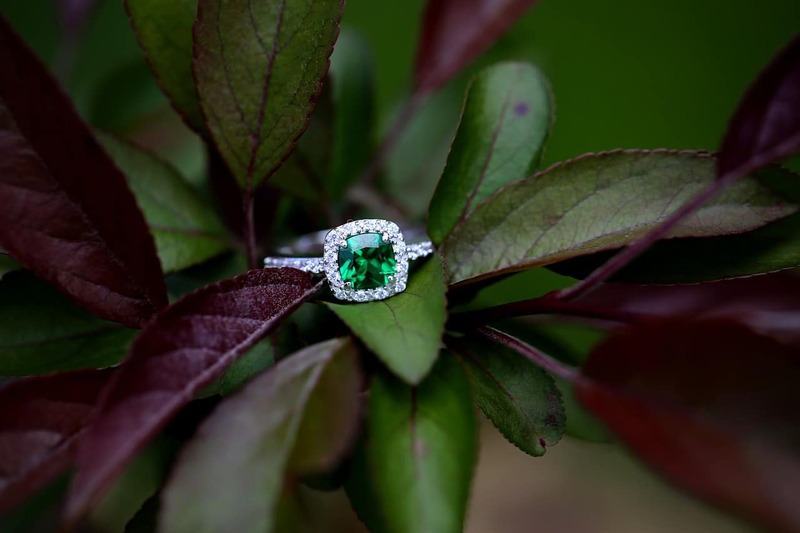 She sported an emerald engagement ring, and colored gemstones, which hadn't been as common recently, came back along with the Art Deco resurgence. 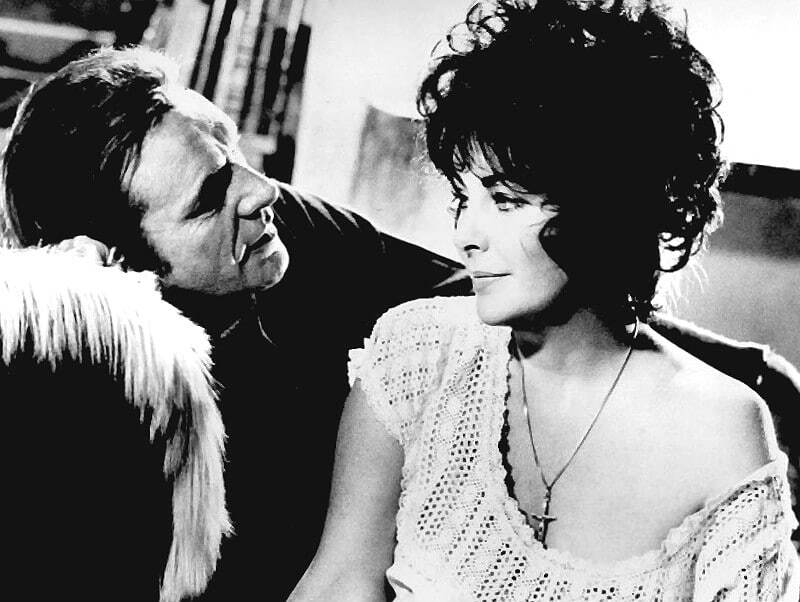 Lastly, there was the celebrity engagement ring to rule them all: the 33-carat Asscher-cut diamond that Richard Burton gave Elizabeth Taylor. If the Sixties were about size, the Seventies were all about the cut. The engagement ring trends of the Seventies were sharp cuts. Angles, square shapes. 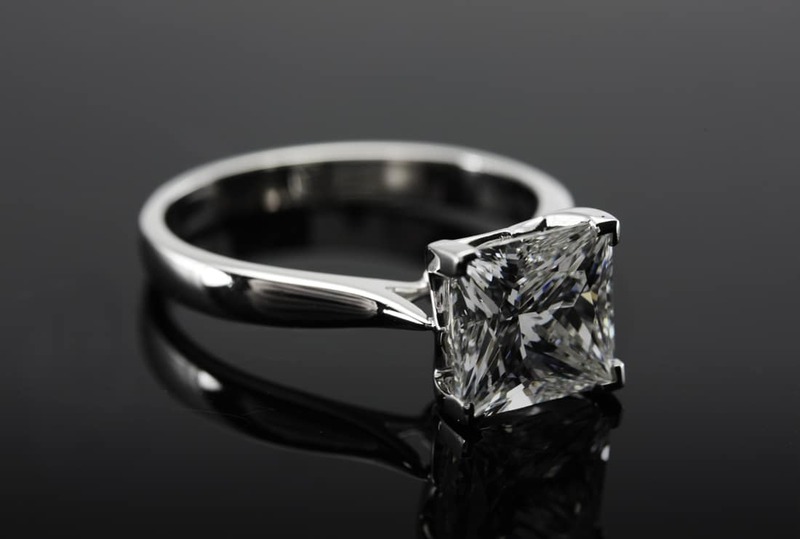 The princess cut became one of the hot new styles, and it remains a popular style to this day. Although it had been first used in 1961, it enjoyed true success a decade later. The Seventies were a difficult time for the United States. The Vietnam War, Watergate scandal, and a series of economic missteps that put the country in a near-constant state of unease. And yet, there were several engagement ring trends that would endure. 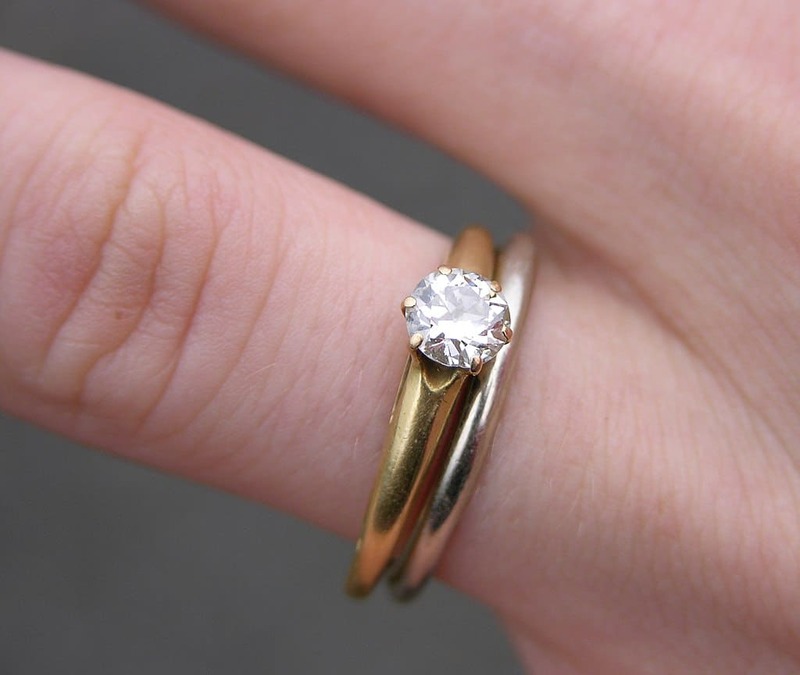 The tradition of matching one's engagement rings and wedding bands became first popularized during the Seventies. Cluster rings also became popular in the Seventies. 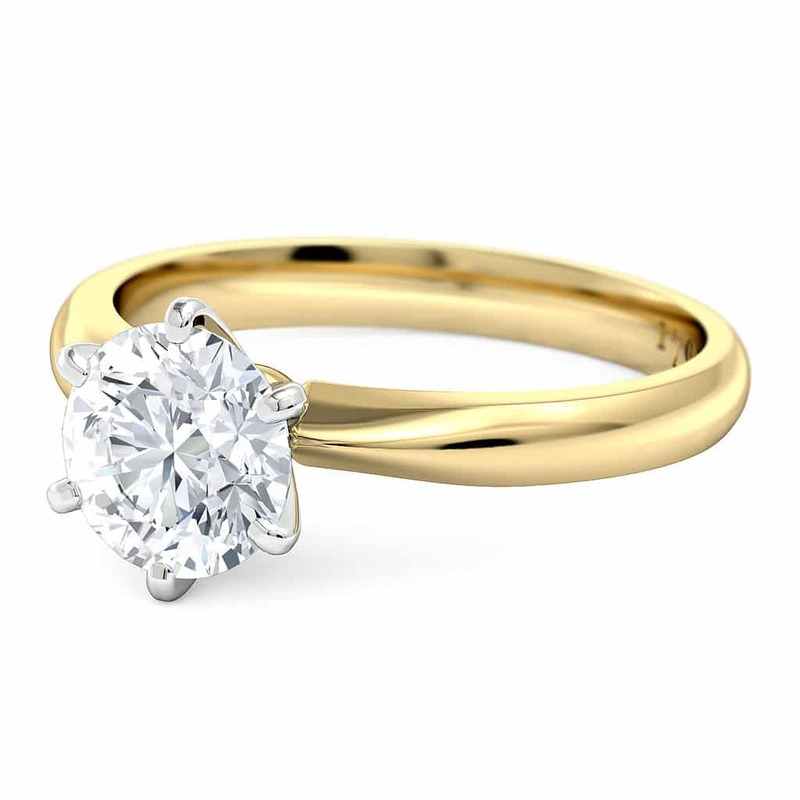 Gold continued to be a favorite metal, and diamonds were standard center stones. But diamonds would get some competition in 1981, all because of one wedding. 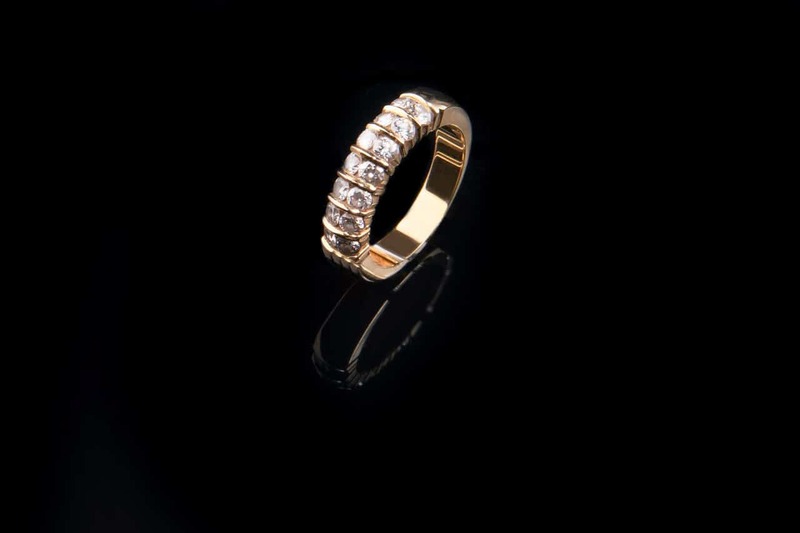 Yellow gold bands and pear-shaped diamonds were hallmarks of the Eighties. 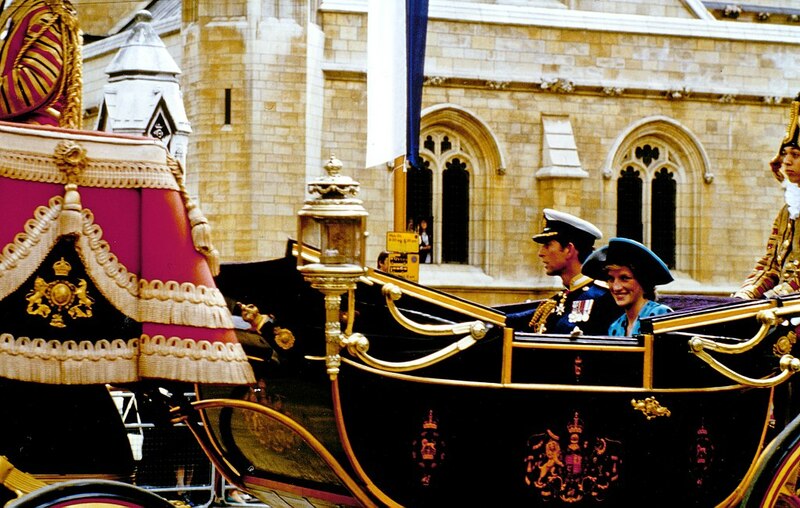 But the British royal wedding of Prince Charles to Princess Diana changed the face of the entire industry. 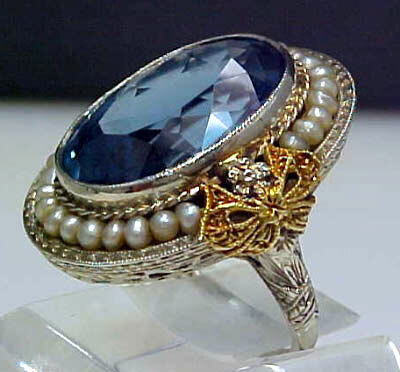 Diana wore a sapphire ring, set in a halo of diamonds. 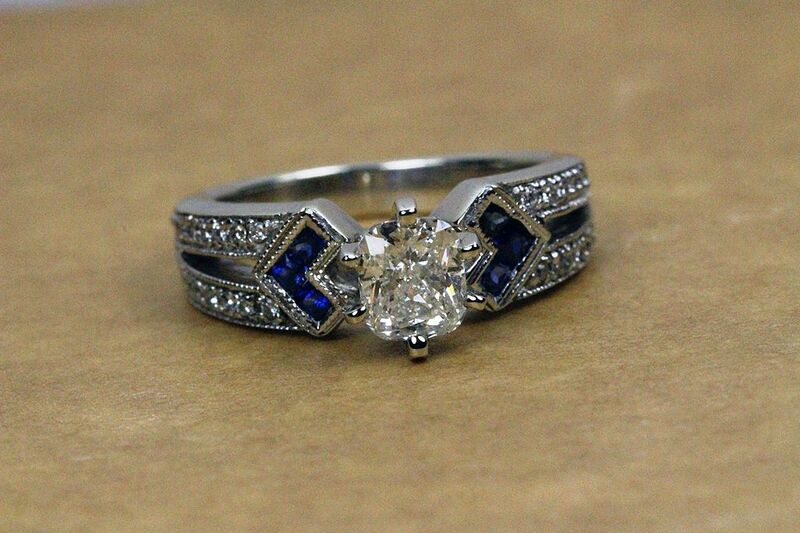 Overnight, demand for the sapphire center stone and the halo design went through the roof. The ring inspired replicas. In addition, it only added fuel to the trend of “bigger, louder” as the design sensibility of the decade. The Princess Di effect was one of the best-known engagement ring trends ever witnessed, simply for its unmistakable and instant effect. In the decade that came next, the industry would be changed by something new: the internet. It is the trend to end all trends: personalization. The rise of the internet in the second half of the decade would ultimately be the biggest game-changer. 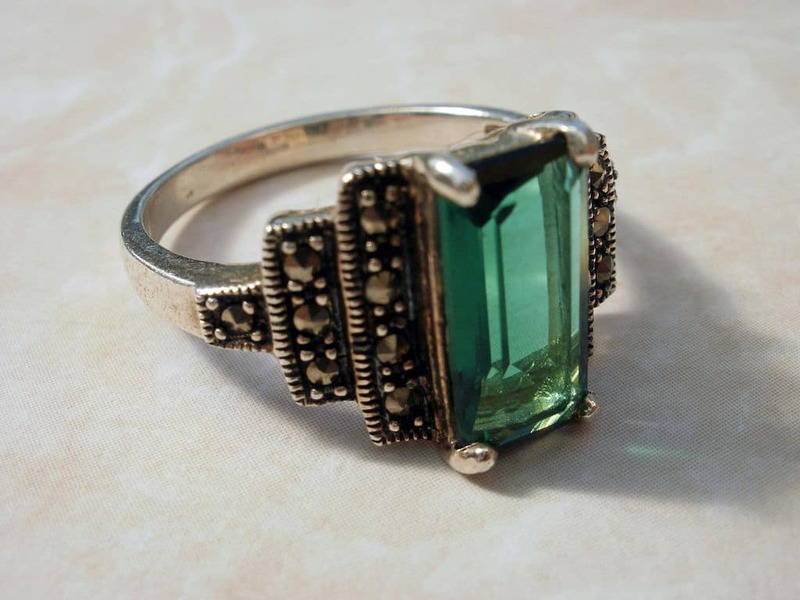 But first, the early Nineties had some definitive engagement ring trends of their own. Marquise-cut and radiant-cut diamonds were the favorite stones of the decade. For bands, white gold and platinum made a comeback. But as the internet began to establish itself as a place to do business, everything changed. People were no longer confined by what they could pick up at their local jeweler. The opportunities to mail away for a ring were also no longer restricted to one catalogue. The three-stone ring also became popular, as it was meant to symbolize a couple's past, present, and future together. But the real trend of the decade, and the one that's persisted ever since, was variety. In the years since 2000, there have been a few trends that have popped up. 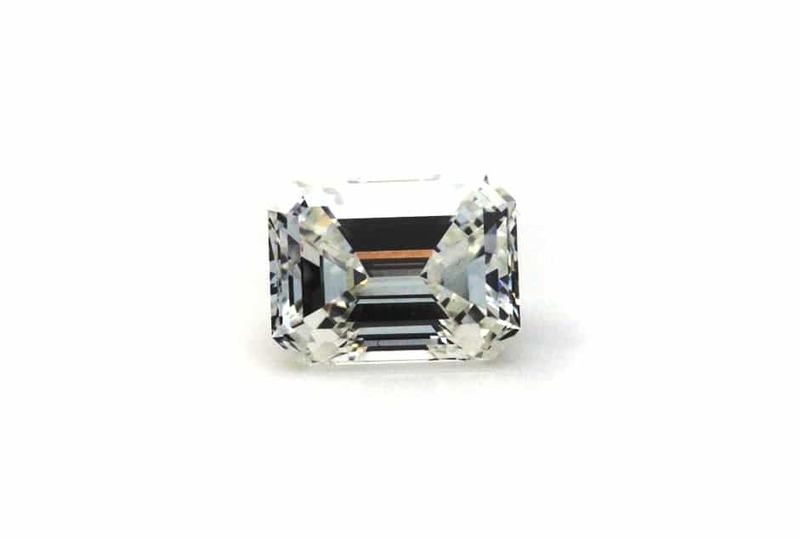 Princess cuts remain popular, as do large center stones with thin bands. But the biggest trend right now is that people have more options than ever before. And we're back at the scene of our proposal. It's a scene that's played out thousands of different ways, in thousands of places and across many decades. But the one constant, perhaps the only constant, is that just as every person is one-of-a-kind, so too is every relationship. If there is any trend that has spanned every decade, it's that the love between two people cannot be duplicated anywhere else. It's unique. And that's not changing any time soon.